Ferndale, MI – Pizza is the perfect election night food for reporters, since we can scroll our screens for results with one hand, while using the other to sneak in quick bites. For this year’s primary election, I went for a more sophisticated pie that was definitely worth taking moments to slow down and enjoy. Seriously, this was an experience in itself. 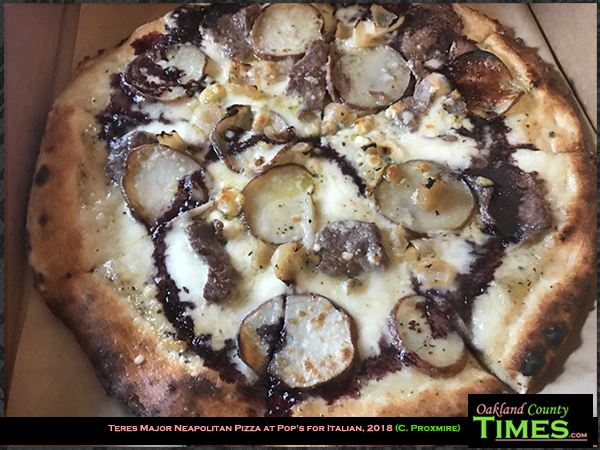 I ordered the Teres Major Neapolitan Pizza from Pop’s for Italian in Downtown Ferndale. 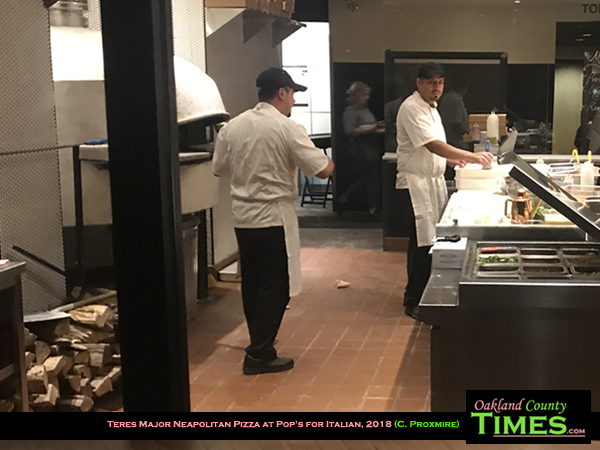 When Pop’s opened in 2016, the owner, manager and head chef went to Naples, Italy to become certified in the crafting of Neapolitan-style pizza, and a special oven was shipped over to make the perfect pies. The 3 ton custom-made oven has a temperature of about 1,000 degrees, a pizza cooks in about 90 seconds. And the ingredients are specific to meet the requirements, including dough that has been properly aged. 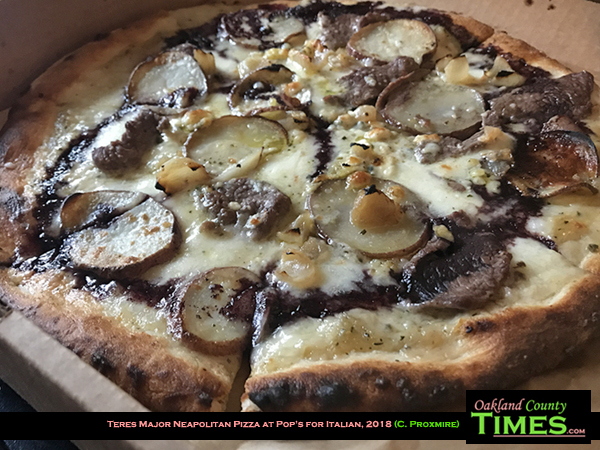 The Teres Major is made with garlic oil and a red wine reduction, topped with mozzarella and Gorgonzola cheeses, thinly-sliced Tres Major Steak, caramelized onions and slices of potatoes. The result was an amazing gourmet pizza that I will undoubtedly order again. 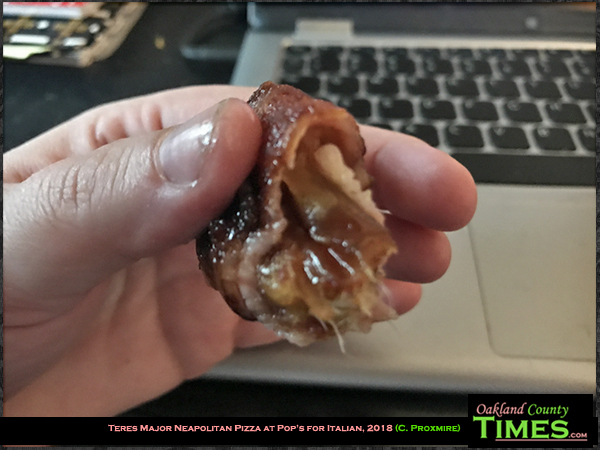 I also decided to try the bacon-wrapped dates. This interesting appetizer mixed sweet and salty sensations. The two-bite treats came with honey-truffle vinaigrette. 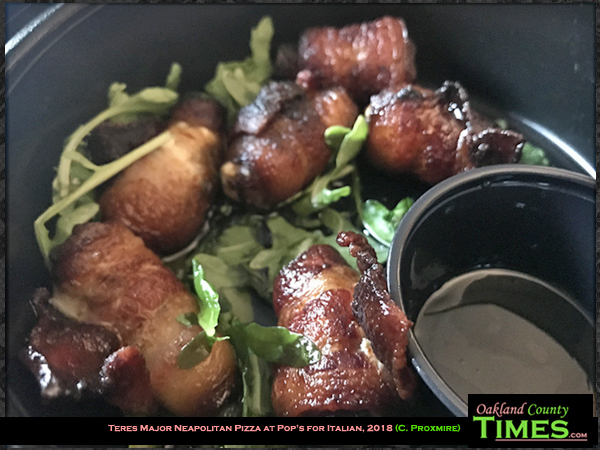 Pop’s for Italian is located at 280 W Nine Mile Rd in Ferndale. They are an advertising sponsor of Oakland County Times. Check them out online at http://www.popsforitalian.com/.